Research supports what parents of boys and girls have always known: Those brains are wired differently. Not all kids fit the pattern, but boys tend to learn better when they have pictures, graphics, and physical movement to help them grasp concepts. Girls often benefit from the opportunity to talk about how to solve a problem and work with others on a solution. These different types of learning can’t always be addressed in the classroom. But making adjustments at home can help students succeed regardless of their learning style. Understanding these differences can help parents decide when to let a child learn in his comfort zone and when to push him to try something that doesn’t come naturally. It can help parents recognize behavior that is typical and problems that might be fixed by tweaking the environment to accommodate different types of learning. Girls tend to mature a little faster than boys, developing language skills sooner and giving them the edge over boys in reading, writing, and speech. While boys are lagging behind girls on writing assignments, they are often ahead in math and science. They might like to build things, manipulate objects, and picture complex objects in their minds. This explains why boys are drawn to construction toys like Legos, complex building puzzles, and even video games. Parents of boys might feel like the classroom is set up to favor girls, who can sit still and listen to the teacher for longer periods of time. Parents of girls might worry that their daughters are praised for being good at reading and writing and not pushed to excel in math and science. And for parents who have at least one boy and one girl, the adventure is in figuring out how to help both succeed in school. One common difference between boys and girls is how they behave after school, Gurian says. All children tend to need to wind down after a hectic day at school. But they have different ways of chilling out. Girls generally like to talk (and talk, and talk, and talk). “Boys more often resist talking after school,” Gurian says, noting that boys can be quick to plug into a music or video device and zone out. For both boys and girls, doing homework immediately after school isn’t often the best strategy. Instead, most kids benefit from some time to decompress in whatever way works best for them. After taking some time to recharge, boys and girls benefit from exercise. Shooting baskets in the driveway, riding a bicycle, walking the dog, and jumping on a tram­poline are good ways to blow off steam. It’s important to let your child do what she enjoys. Here are more of Gurian’s tips for creating the best possible environment for different types of learning. Encourage frequent breaks from homework to move around. For example, he can do 15 minutes of homework and then 15 minutes of shooting baskets. Set a timer. Help him move around while studying. Toss a football back and forth while calling out spelling words, or make up studying games that require movement. For example, call out study questions; if he misses, you get to assign him an activity, such as running up and down the stairs three times. If he gets the answer correct, he gets to assign you an activity. Find creative ways to help him stay focused. For example, maybe he can walk on a treadmill while reading or sit on a balance ball instead of a desk chair. Help your son stay organized. It might not be enough to buy him a homework binder and check it every Friday. You might need to go over it with him every day as part of his homework routine. Talk to his teacher about his learning style at the beginning of the year. The more information she has about him, the better she’ll be able to respond if he fidgets a lot during quiet study times. Teachers are well-versed in different types of learning, but they might not have enough opportunity to identify every student’s specific style so early in the school year. Ask for alternatives. If your son is struggling with a narrative book report, see whether he can demonstrate his understanding in a different way, such as a slideshow presentation or a podcast. Provide toys and activities that encourage her to build and manipulate things. Puzzles, construction toys, and blocks are great choices for both girls and boys. Talk it through. When she gets stuck on her homework, she might benefit from discussing the problem and various approaches to solving it. Or she can write you an email describing her struggle to solve the problem. Point out everyday math and science concepts. For example, when you slice a pizza, show her how you’re using fractions. If you’re adding a deck onto your house, let her use a computer program to design it based on the required dimensions. Promote exercise. If your daughter likes to lounge around reading all day, make sure she also makes time to move around. Play kickball, soccer, and other games to help her develop gross motor skills. Talk with your daughter’s teacher about her learning style. If she hides her lack of confidence behind good behavior, her teacher needs to know at the beginning of the school year. Ask for alternatives. 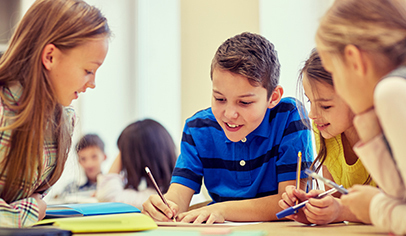 If your child is tuning out in subjects she feels less comfortable with, see whethr the teacher will consider options such as an art or technology project, a creative writing assignment, or group work. Speak up if you see your child’s teacher unintentionally depriving her of leadership opportunities. Girls can take the lead on a group science project, but they might need extra encouragement. Often, even girls who excel at leadership tend to pull back and let the boys dominate. All children are different and require varied and often creative approaches. By understanding the differences between girls’ and boys’ types of learning, you’ll have a head start on supporting your child. Originally posted in 2011 and updated regularly.